The story of Iwao Hakamada, a former professional boxer and death-row inmate, 82, who continues to battle to clear his name over a 1966 quadruple murder, will be adapted into a manga series, supporters of the convict announced Wednesday. Hakamada was sentenced to hang in 1968 by the Shizuoka District Court, but was freed in March 2014 after nearly 48 years in prison on death row. Much of that time was spent awaiting his retrial, which has yet to be held. But a group of Hakamada’s supporters who believe the former boxer is innocent want to retell the events in his case in the form of a manga, to convey his side of the story to younger generations. 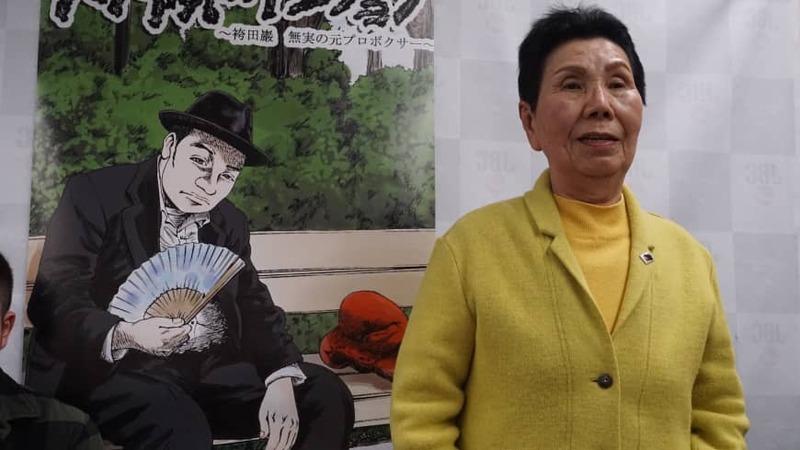 To better portray the atmosphere and circumstances surrounding Hakamada’s arrest and his trial, the supporters are working with a manga artist from Shizuoka Prefecture. Shigemi Mori, 30, who shares Hakamada’s experience as a professional boxer, will create the series. In his younger years Mori lived in Shimizu, an area that is now part of the city of Shizuoka and is also where the 1966 murder occurred. “I want to tell people how sloppily the investigation was conducted and what Hakamada’s life has been like, in as understandable a way as possible,” Mori said Wednesday at a news conference in Tokyo. He said he learned about Hakamada’s case as a junior high school student and then-aspiring boxing apprentice, and started questioning the trial that put Hakamada behind bars. The manga will be released in six episodes under the title “Split Decision,” with the first episode scheduled for publication on Feb. 15. Eight-page episodes will be published at jpbox.jp/hakamada2.html on the same day of every month. Those behind the project also plan to translate the series into English and make it available via YouTube to reach a global audience. “I like the title,” Hakamada’s elder sister Hideko said at the news conference. Conceived by Mori, the title is a winning criterion used in boxing matches in which two of three judges pick a different winner than the third judge. The title also reflects supporters’ criticism of the “unfair” decision in which Hakamada was sentenced to death by a 2:1 majority. The courts’ decisions were split over DNA tests on bloodstained clothing found near the murder victims. “I promised to do everything I can (to prove Iwao’s innocence) and I did,” Hideko said. She lamented, however, that her efforts to convey her plea have gone unheard. “It won’t help anything if I tell his story, so I want to convey it through manga,” Hideko said. Hakamada was a live-in employee at a soybean processing firm in Shizuoka when he was arrested in August 1966 for robbery and the murder of the firm’s senior managing director, his wife and two children. The police found their bodies with fatal stab wounds at their fire-damaged home. Hakamada initially confessed to the charges, but changed his plea at trial. The Shizuoka District Court found Hakamada guilty and sentenced him to death in 1968. The sentence was finalized by the Supreme Court in 1980. Hakamada and his family have long sought retrials, to no avail. But a new development came in 2014 when the district court accepted DNA test results undermining the prosecution’s claim that Hakamada’s blood had been detected on clothing found at the crime scene. The court noted that the evidence could have been fabricated by police. Then, last June, the Tokyo High Court overturned the lower court’s ruling granting the retrial, questioning the credibility of the DNA analysis method. Hakamada’s lawyers are planning to appeal that decision to the Supreme Court. Hakamada’s case has gained international attention as the former boxer remains the world’s longest-serving death row inmate. Japan’s capital punishment system has also been criticized internationally as inhumane. Hideaki Nakagawa, director of human rights advocacy group Amnesty International Japan, who was present at the news conference, believes the manga will and should spark debate regarding capital punishment among the public. As of January, 110 inmates were awaiting execution and 86 of them are seeking retrials, according to the Justice Ministry. “The fact that more countries than ever before have voted to end executions shows that global abolition of the death penalty is becoming an inevitable reality. A death penalty-free world is closer than ever. GOLD – US is a Retentionist Country – as such the status here is questionable? 1989 CAMBODIA abolished the death penalty for all crimes. 2007 KYRGYZSTAN abolished the death penalty for ordinary crimes. 2008 UZBEKISTAN abolished the death penalty for all crimes. 2015 FIJI abolished the death penalty for all crimes. 2016 NAURU abolished the death penalty for all crimes. 1 July 2017 MONGOLIA abolished the death penalty for all crimes.